The strength and balance of a developed caliper increases pedal feeling and controllability. 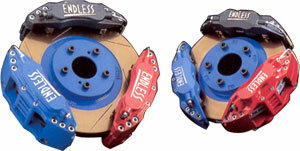 Endless has succeeded in producing a lightweight, strong caliper. P6 heat-treated, powerfully constructed cast alloy aluminum materials. Race-tested on the proving grounds of Japan's most infamous circuits. Unsurpassed in performance, weight, and aesthetics.